Sunroom additions are a popular investment for homeowners in the Pensacola, Florida, area. One of these outdoor living structures can help to maximize the overall space of your home, providing you and your family with a wonderful area to relax and enjoy the beauty of your backyard without dealing with insects, harmful UV rays, inclement weather, and other outside nuisances. You’ll have a beautiful space to entertain guests, enjoy a meal, or simply unwind with a magazine or book on a lazy weekend morning. And, when you’re looking for an experienced installer of sunroom additions in Pensacola, Majors Home Improvement is the company to trust. Experience – We’ve been installing sunroom additions and other outdoor living products (as well as windows, siding, hurricane shutters, and more) since 1997. You can trust that we have perfected our installation procedures and have built a solid reputation for excellence through the years. Quality – We install sunrooms from TEMO, one of the leading product manufacturers in the outdoor living industry. They have been manufacturing sunrooms since 1970, which means their products have the kind of durability you would expect from a long-standing company. Protection – Because we have faith in our products and services, we provide a warranty to protect your investment for years to come. 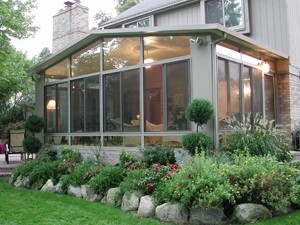 At Majors Home Improvement, we’ll happily work with you to discuss your design options for your sunroom. We offer many different styles that complement a variety of home architectures, including studio, cathedral, and California. What’s more, TEMO sunroom additions are energy efficient, featuring high-performance glass and thermal roofs to lessen the transfer of heat energy in the room, keeping your sunroom comfortable – even on hot summer days. To learn more about our sunroom additions for Pensacola, FL, area homeowners, contact Majors Home Improvement today.